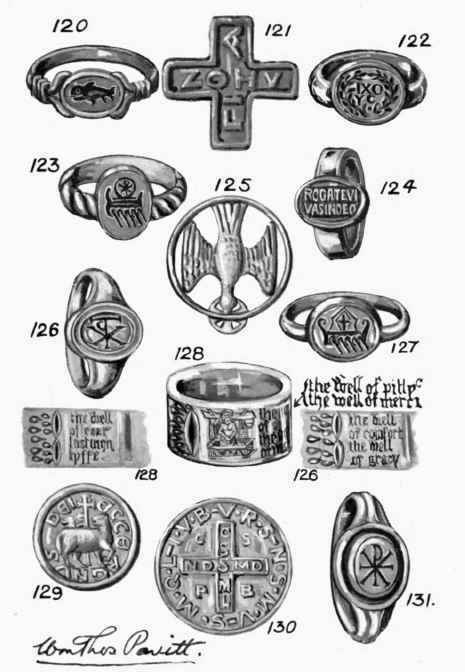 At the time of the founding of the Christian religion and onwards through the Middle Ages the symbols used during the services, certain texts, mottoes, and prayers were very popular as Talismans. They are often found in combination with symbols used in preceding religions, and were worn for protection from temptation and all kinds of perils, dangers, and diseases. In the earliest days when open avowal of faith meant peril and persecution, these Talismans were of great service in making fellow-believers known to each other, and when Christianity was established were extensively worn, with the approval of Clement of Alexandria. One of the oldest Talismans of this kind is The Fish, said to have been adopted because its Greek name ıxθγ∑ formed the initials of the sentence "Jesus Christ, Son of God, Saviour." The form of the Fish is very similar to that used by the Egyptians and is illustrated on Plate IX, No. 120. Another explanation of its use is that in the Talmud the Messiah is often designated by the name "Dag," the Fish, and the sign of His second coming, it is said, would be the conjunction of Saturn and Jupiter in Pisces, which is the origin of the three fishes interlaced into a triangle, a very popular ornament in mediaeval architecture.